One of the things I enjoy about writing this blog is that it feeds my curious nature, in part because I want to be thorough and as accurate as possible before I hit “publish” in my WordPress. For example, I was planning to start this post with the quote you’ve probably heard, “The only thing constant is change”. Not a student of philosophy, I wasn’t aware until I checked around (in other words, googled), that it was the philosopher, Heraclitus of Ephesus who framed the idea that life is always in flux and that those who cling to the idea that things should always stay the same are doomed to suffer. Alrighty then. You can read more about Heraclitus here if you’d like. It’s funny how you can spend your whole life repeating certain phrases or sayings like I am oft to do and never take the time to figure out how they came about (I could do a whole post on these types of sayings). Anyway, there are constant reminders that life is in flux and things are always changing. If I look around my own life, my neighborhood has completely changed since we moved to our house 22 years ago and is changing still (new neighbors moving in next door). Our children have grown and while they still need us, they spend more time not living with us than under our roof. Three of our parents have left us and we have sadly lost a few friends. Or even take the weather. In our small New England town, we actually experienced a tornado this past week that affected 39 homeowners and wreaked havoc in its path. Thankfully nobody was hurt, but I can tell you that I have never been woken up at 3 AM to an alarm suggesting we retreat to the basement for fear from a tornado. The landscape of our weather is forever changed now. Change is hard and can often be fraught with so much emotion, it’s hard to be thankful for what we had when we had it! I think the older I get, the more I realize that change is truly the only thing we can continue to expect from life moving forward and rather than fight it, we need to embrace it as part of the future (lest we suffer according to Heraclitus). In our town, there are several places to meet a friend for coffee or to grab a sit-down, casual lunch. I frequent nearly all of them and to be honest, I don’t really have a favorite. It’s more a mood or a friend’s preference that drives where we go. But when one of our mainstays, a casual French restaurant named La Provence decided to shut its doors after 18 years in business, I do think there might have been a collective gasp heard around the town. Wait what? No more sandwich au jambon? No more 3 salad plate? No more split pea soup? No more quiche? No more beautiful pastries and imported French pantry items to purchase? Quelle horreur! Honestly, it’s a loss as it was centrally located with easy parking, ample seating, lots of menu options and a bright and cheerful setting. It will be sorely missed and I know my friends join me in thanking the owner, Robert Didier for bringing a little bit of France to our town for almost two decades. When the announcement came over, I wrote on a Facebook post from our local newspaper that I would truly miss two of the many salads La Provence offered on the daily. I had lots of favorites but usually stuck to their Chicken Provence and Lentils that were mixed with just a touch of tomato and feta cheese as part of my 3 salad plate. I was speaking with my friend Betsy this week about La Provence and mentioned that I wished I had the recipe in particular for the Chicken Provence as it was such a lovely chicken salad. Flavored with dijon and grainy mustards and accented simply with sliced red and green peppers, Chicken Provence should be salvaged we thought, Heraclitus notwithstanding. And so I set out to determine if I could recreate the dish in my kitchen this week. I knew the direction I wanted to go in (make it light and flavorful) and started by looking through every single cookbook I own that is either written by a French author, an American living in France or one inspired by the country’s cuisine. I found zip. 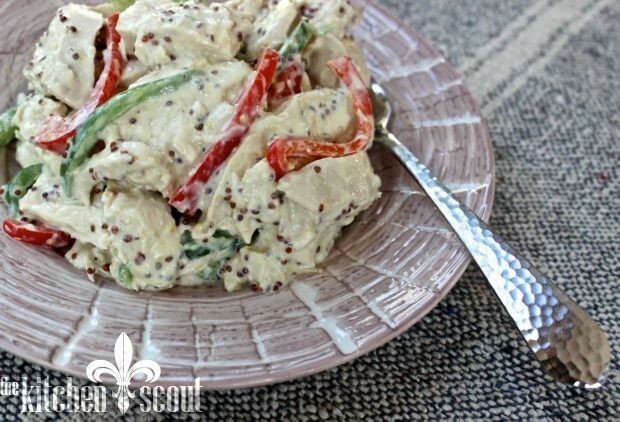 So I started with one of Ina Garten’s recipes for Mustard Chicken Salad, but despite the positive reviews I had to make some meaningful changes to make it a little healthier and more like the inspiration dish. I liked it on day one, my husband ate it for lunch on day two and then texted me if that was ok (It was, even though I needed to take more pictures). He said it was very good, and then I had some more on day two and thought it was even better than day one. We’ll finish it today and tomorrow which is as long as I like to keep salads of this nature. While I wouldn’t say it’s exactly the same as La Provence, it is pretty darn close and an adequate substitute for the inspiration dish. As for those La Provence lentils, I am relying on a recipe I have made from The Paris Cookbook by Patricia Wells to get me through. I usually adapt it by swapping out her walnut oil with olive oil. You can see a variation on that recipe here. Even if you didn’t have the pleasure of dining at La Provence, I think you will enjoy this easy to prepare and classic Chicken Provence. Great for entertaining or just to have on hand. If you make it, please let me know what you think in the comments. 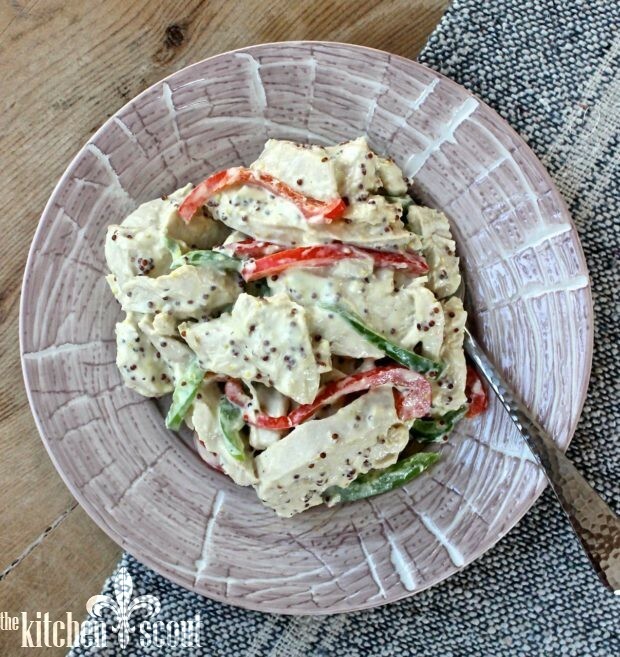 Recipe inspired by the former La Provence Restaurant in Concord, Massachusetts and Ina Garten's Mustard Chicken Salad. If you'd rather not work with bone-in chicken, you can certainly use boneless chicken breasts that you poach in the oven after seasoning well with some olive oil, salt and pepper. Any color peppers will work, but red and green were the colors used by La Provence! Enjoy. Place the chicken breasts on a sheet pan lined with parchment paper. Drizzle well with olive oil and season generously with kosher salt and freshly ground pepper. Roast in the oven for approximately 40 minutes and then allow to cool for about 15 minutes. Remove the skin and the meat from the bones. Slice the chicken into 1/2 inch slices or chunks depending on your preference and place in a bowl. It's important to work while the chicken is still warm so that it can properly absorb the dressing. While the chicken is cooking, prepare the dressing. Whisk together the yogurt, mayonnaise, mustards, wine, 3/4 teaspoon kosher salt and 1/2 teaspoon freshly ground black pepper. Set aside. Toss the warm chicken slices with a little bit of the dressing and then continue to add more dressing to your liking (I added most of the dressing, but held some back to freshen up the salad the next day). Toss the pepper slices with the chicken until thoroughly combined. 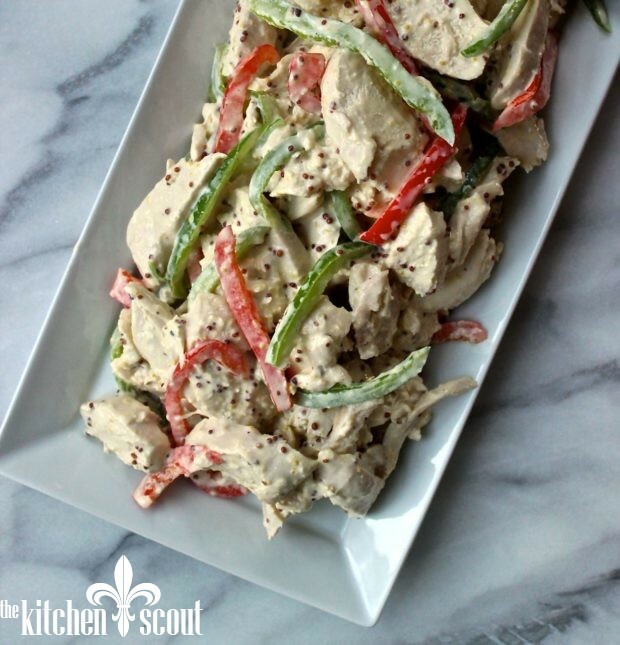 Allow the chicken salad to sit in the fridge for a couple of hours for the flavors to develop. Overnight is even better! To freshen up the salad, you may want to add some of the reserved dressing the next day. Best eaten after sitting out for about 15 minutes. Thanks for this post. I miss La Provence for all the things you note and his heavenly organic roasted chicken when I was too lazy to do one myself. Truth is, theirs was better! Looking forward to trying your take on the mustard chicken. Thanks for writing, Jean! Yes, La Provence will be truly missed. I hope you like my version of the chicken salad! Love this post about change! Similar to my own saying ” he who changes the best wins”. Never knew that warn chicken is way to go with dressing and flavor. Thanks.